Toddler (2-4) - £16.99 Only 7 left! Listen, we’ll be honest - our little buddies aren’t always exactly sweet little angels, either! Angelic silence? Ain’t having it! Cherub sweetness and smiles? More like trouble-making evil grins! In fact, sometimes, when we’re watching them scream their heads off, creating apocalyptic messes and causing mass chaos everywhere they go, we’re almost certain that they came from a higher power - and that power does not trade in halos and angel wings, if you know what we mean! But we also wouldn’t have it any other way - we love our funny little tricksters! They’ve got the biggest personalities, they get in the best kinds of trouble, and their mischievous ways are always keeping us on our toes! And we’d definitely sell them our souls if it meant that they could stay this devilishly cute and fun forever! So if you feel the same way about your cute little devil, then this Lil Devil Baby Costume is the perfect little costume for your little horned angel! Made of 100% polyester, this red plush jumpsuit comes with non-skid booties. The flames are screen-printed on the legs, and there’s even a plush tail and two black wings attached to the back! It also comes with a horned devil hood! 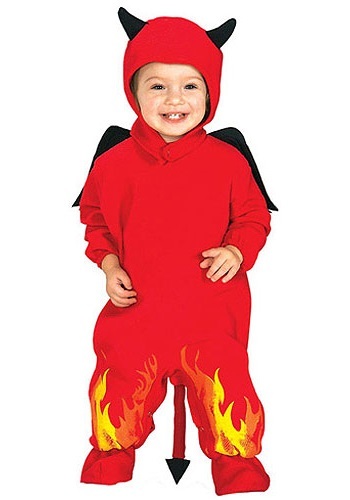 This Lil Devil Baby Costume also comes in an array of great young child sizes: We have also Infant, Newborn, and Toddler devil costume sizes! Better yet, dress up the whole family in an array of devil and angel costumes for a Good vs. Evil costume party look!